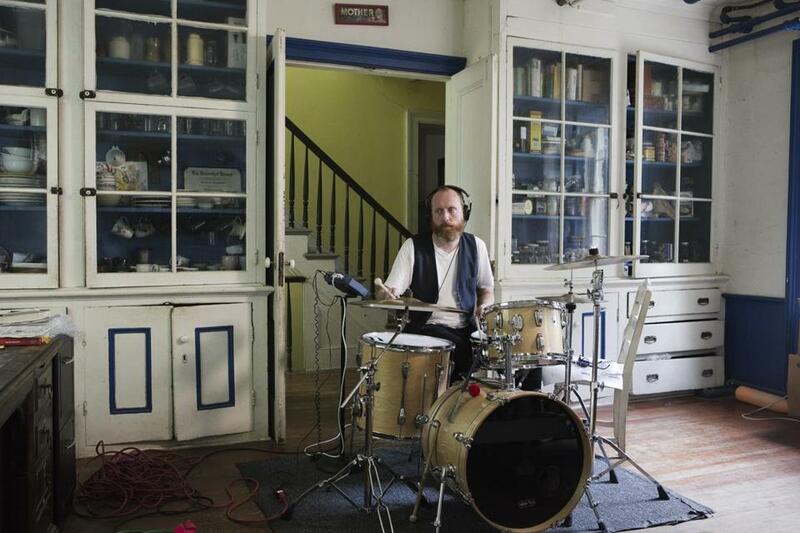 Ragnar Kjartansson’s nine-channel video installation “The Visitors” opened Wednesday at the Institute of Contemporary Art, and promises to be the hit of the summer. The work seems to me to be a generational masterpiece. When it screened at the Luhring Augustine Gallery in Manhattan last year, it was a tear-away success. Years from now, it may even be remembered as having helped trigger a change in the climatic conditions of contemporary art. Aside from anything else, “The Visitors” is a triumph of tone. Alive to the preposterousness of its premise — a bunch of hipster musicians from Iceland squatting in a grand home on the Hudson (shades of the Rolling Stones recording “Exile on Main Street” in a mansion on the French Riviera) in order to perform a repetitive, rather unremarkable song — it somehow transforms latent irony into sincere and open-hearted expression. You never even notice the gear change. The whole thing is like catching a wave, against tough odds, and turning around to discover dear friends all whooping with delight on the same surfboard. At the ICA, in a darkened room, eight large screens each present a view of a different room at Rokeby Farm, a 43-room stucco mansion emanating fraying splendor in Barrytown, N.Y. A ninth screen shows a gathering of people on the home’s veranda, which has a view out over a meadow toward the Hudson River. Each screen has a speaker immediately above it playing back the part of the musician it shows. So as you move around the gallery, the different parts come in and out of prominence. The song, a relaxed but plaintive descending melody, aerated by several pauses and lasting less than 20 seconds, is repeated over the course of an hour, with beautiful, shifting multipart harmonies and variations in instrumentation and dynamics. It sounds — and in many ways is — unprepossessing. But “The Visitors” gathers steam beneath its laconic surface, and you walk away marveling at the transformation it has effected inside you. It’s hard to over-emphasize the significance the words end up carrying — but then possibly any lyric, graced with such lush harmonic ornamentation, would feel freighted with profundity after so many repeats. The lyrics, we learn, are from a poem by Kjartansson’s former wife, the artist Ásdís Sif Gunnarsdóttir. (The two separated more than two years ago, but have a young daughter and have remained on good terms.) Charged by the melody’s inchoate ache, her words evoke a mood of ironic, possibly bitter resignation. They take on different hues — sometimes humorous, sometimes soulfully lamenting — depending on who is singing them. At the ICA, in a darkened room, eight large screens each present a view of a different room at Rokeby Farm, a 43-room stucco mansion emanating fraying splendor in Barrytown, N.Y. 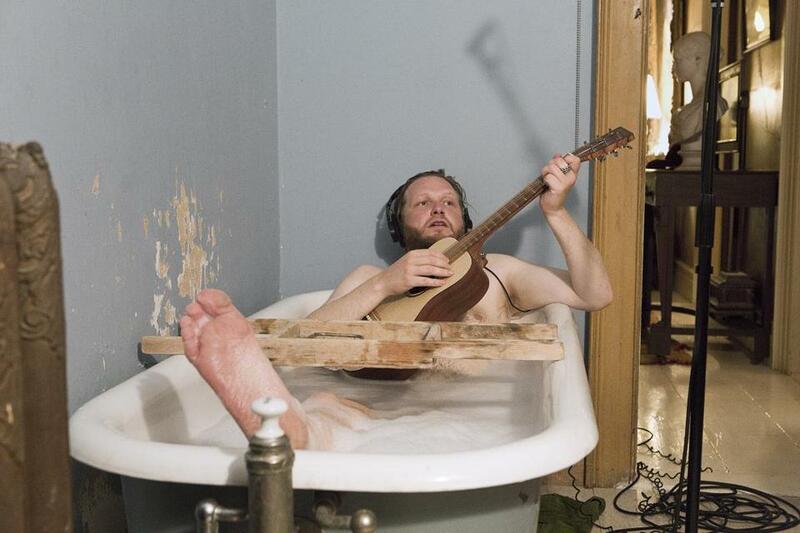 The song’s polyphonic drone is broken intermittently by different melodies, some delivered solo by Kjartansson in his bathtub. These alternative parts have lyrics drawn from other parts of Gunnarsdóttir’s poem (e.g., “There are stars exploding / And there is nothing you can do”). At the end of the hour, the musicians one by one take off their headphones (the sleeping girlfriend wakes up and puts on a satin slip), leave their instruments, and gather together in a large room. There, beside a grand piano, the singing continues — but now a capella. Champagne is uncorked, cigars are lighted, and then the shaggy troubadours, aglow with youthful fellow-feeling, spill out of the house. Joined by the folks on the veranda and a couple of dogs, they amble across the field toward the river, singing heartily all the while. As all the interior rooms are evacuated, the separate screens are inevitably drained of interest, and the audience ends up echoing the movements of the performers, until everyone has congregated in front of the screen showing the outside. This improvised, uncalculated effect is charming. At the ICA, each screen has a speaker above it playing the part of the musician it shows. It presents itself as slackerishly devoid of ambition, but “The Visitors” — like Kjartansson’s recent marathon live performance piece at the New Museum in New York — actually heaves with a yearning for beauty, an ache for love. The ache is powered, of course, by nostalgia, but also by an urgent, aesthetic desire to throw off something felt as too much in the way of today’s artists: the burden of intellect. In a setting that is not so much dissonant as ill-fitting — suggestive of an artistic inheritance so grand it can only be awkward — it posits the possibility of an escape from the cul-de-sac of too much history, too much civilization — and not least, too much critical thinking. It posits the possibility of a foray into true feeling.